Camping Armenistis is a veritable oasis of incomparable beauty, ideal for family and activity - oriented holidays. The site runs the length of a breathtakingly beautiful beach, awarded a Blue Flag each year. Apart from the superb opportunities for swimming and diving, there are also lots of other sporting activities. The campsite invites you to a world of alternative holidays: golden beaches, crystal-clear waters, fields. For back-packers looking for a bed for the night, accommodation is available in our Υouth Ηostel tents. The perfect summer destination – only 90 minutes from Thessaloniki - famous for its warm and friendly atmosphere and ideal setting. Located right on the sandy beach of Sarti in Chalkidiki and set amidst lush greenery, Armenistis Camping features a private beach area, a beachfront bar and a Mediterranean restaurant. It includes a mini market, a basketball and a soccer court and watersport facilities on-site. 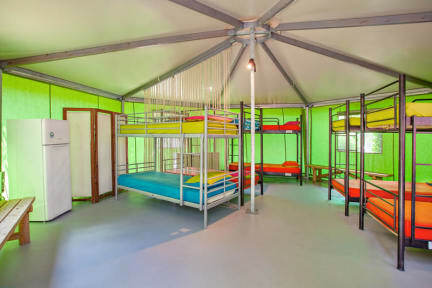 These large tents provide everything in the way of high-quality, comfortable accommodation. Each tent has 8 beds and lockers for your luggage. In front of the tents you will find a barbecue area, fridges and a shaded area where you can relax. The facilities are kept scrupulously clean and we are confident that you and your friends will enjoy an unforgettable stay. Guests can have a swim at the crystal clear sea and enjoy a coffee or a cocktail at the beachfront bar. Drinks and light meals can also be enjoyed at the shaded terrace of the snack bar, while fresh fish or grilled meat is served at the on-site restaurant. Payment upon arrival by cash, credit cards (except Diners, American Express), debit cards. This property can pre-authorise your credit card.